For those who like your etymologies straight and simple, consider an interpretation of the heroine's name from this famous novella. Katharina is a Teutonic form of a Greek name widely understood to mean pure (catharsis is often cited as a related term), while Blum is almost a German flower, just like virág is a Hungarian flower and the original surname of this great epic's protagonist. And our heroine is indeed a pure flower, a lonely bead of buds lying in a corner of a small, semi–urbanized apartment whose market value she could not possibly afford. She works as a housekeeper for two well–off couples, has her own car, and generally leads the plain but unencumbered life of the average or slightly above–average German. She is young and lean, shy and sexually prudish, sensitive and attractive, educated and cultured if skeptically religious, and, most of all, hard–working and lonely. She also has two "life–endangering qualities": loyalty and pride. In other words, she is a perfect metaphor for postwar Germany itself. Now one may ask oneself, as so many Germans did in the 1970s when even the closest adviser to the West German Chancellor turned out to be a spy, how did someone like Katharina Blum ever come into such plebeian ease? Consider her demographic: "those pretty young brown–haired things, thin, between 5'4" and 5'6" in height and 24 and 27 in age; here at the Carnival you'll see hundreds of thousands of them walking about. " She is at once beautiful and common, but in the way a solitary rose is beautiful and common. That is because we cannot have a heroine to embody Germany that looks or acts or talks like no one else. She must be representative, typical, forgettable; otherwise she would not be a nation but an artist. However you choose to examine the matter, Katharina is so symbolic that she acquires her own personality. Now and then, she is portrayed by our omniscient narrator as fickle and moody; she looks after her gravely ill mother with an indifferent air, but waits to weep in private upon her death; she does not allow some of the older men in her life, usually patrons of a club where she tends bar and serves drinks, to do more to her than drive her home, although they certainly try to do more; and we are informed early on that she was once married. To a parasitical drunk no less, who was one of the first persons to libel her once news of her crime is made public. That crime of hers. What Katharina is ultimately accused of having done is hardly surprising given the circumstances. But the bitter irony is that her reputation is already tarnished even before she decides to act. And here, I must say, the reader more familiar with the political events of 1970s Germany will grasp nuances that elude those who think that the RAF only stands for Britain's air squadrons. 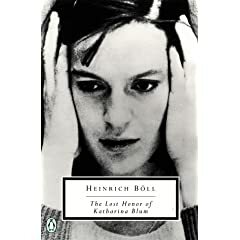 That Katharina is vilified for cavorting with and bedding a known criminal, a whim made even more reprehensible by the fact that her nickname is "the nun," should tell you a great deal about what Böll thought of the establishment in his homeland. A curious notion, that. Having been born in the mid–1970s I have always cultivated an image of 1960s and 1970s Germany, a period of remarkable economic and cultural resurgence known in German as "The Miracle," as one of the paradises I can only visit in dreams and magnificent works of art. Böll, however, doesn't quite see things that way. His vision of Germany is strewn with remarks about its hypocrisy and yellow journalistic tendencies sprung from an overattentiveness to scandal that is both typically German and a reaction to the unending international scrutiny of German ethics in the twentieth century. Katharina, like Germany, is isolated and assailed on all sides. Her family is retconned into a band of profligate leftists and every trace of humanity and decency is erased from her record. In the end, we are duly aware of whose honor has been violated and we smile. We smile because we know that Katharina, despite her flaws, will flourish and rise to the heights she deserves. "She is young and lean, shy and sexually prudish, sensitive and attractive, educated and cultured if skeptically religious, and, most of all, hard–working and lonely. She also has two "life–endangering qualities": loyalty and pride. In other words, she is a perfect metaphor for postwar Germany itself." In more other words, she is also the perfect description of every girl I've dated. How about a review of Terror's Advocate? Would love an exegesis of the phenomenon that is Jacques Vergès. Suggestion duly noted and likely to be accommodated. Look also for another of Barbet Schroeder's works in the weeks to come.